Denny Jump (Bellevue, WA, United States) on 13 December 2017 in Landscape & Rural. I made this image 2 years ago on a cool New Jersey October Morning...(Don't ever let anyone tell you that New Jersey and Pennsylvania are ugly states!). 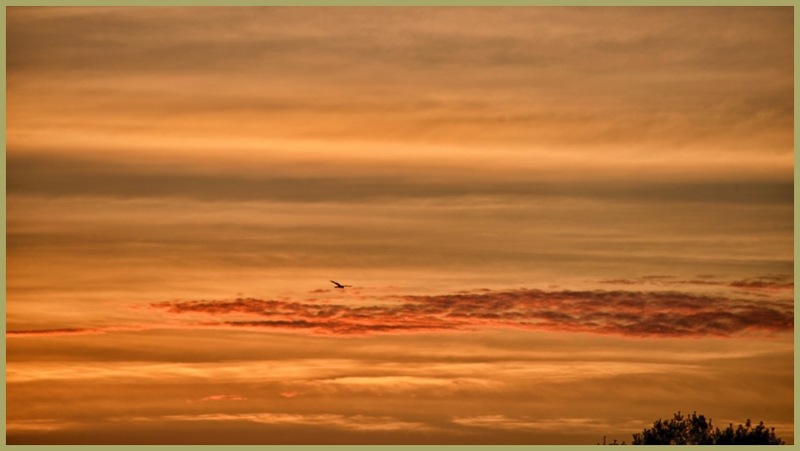 I Was standing in a favorite spot near my work office and was mesmerized by the colors in this sunrise.....When all of a sudden to my wondering eyes (or something like that) there appeared a beautiful bird in my lens - in the view of my lens, that is... I figured this was the time that I should hit the shutter...so I did. Ah, yes, I can understand and share the feeling of this moment . . at times like this there is that 'oneness' that eclipses the chaos of Life. Gorgeous color captured in this dramatic sky!! The bird adds a nice finishing touch. "Colours!" said the Canadian with Canadian spelling. "Colors!" said the American with American spelling. And they were BOTH right. Very pretty and nicely timed. I also like that bit of tree top in the frame as a sweet connection to terra firma. A gorgeous sunrise with these amazing colors and a fine big bird. Superb shot and feeling here. This is just gorgeous. What a magnificent sunrise! The color is just spectacular! The colours are fantastic Dennis and the bird in flight is a lovely touch too. Magnificent. @Darkelf Photography: Thank you so much, Maciek! Superbe ta photo avec ces belles couleurs ! The hue is unique, looks like a syrup I sip with my eyes !